Engines: Twin Mercruiser 4.3L, V6 gas. Fuel injected, freshwater cooled. Speed estimates per owner: 25 knots at approx 3200 RPM; 30 knots approx 3400 RPM. Outdrives: Bravo lll duo props. Maintenance winter 2019: new zincs and bottom paint. Hot water tank: 6 gal Kuuma. Snap-in carpet covering cockpit area. Waterline Boats / Boatshed did not independently verify capacities, or dimensions described in this listing. Information is derived from seller-provided information and/or literature. 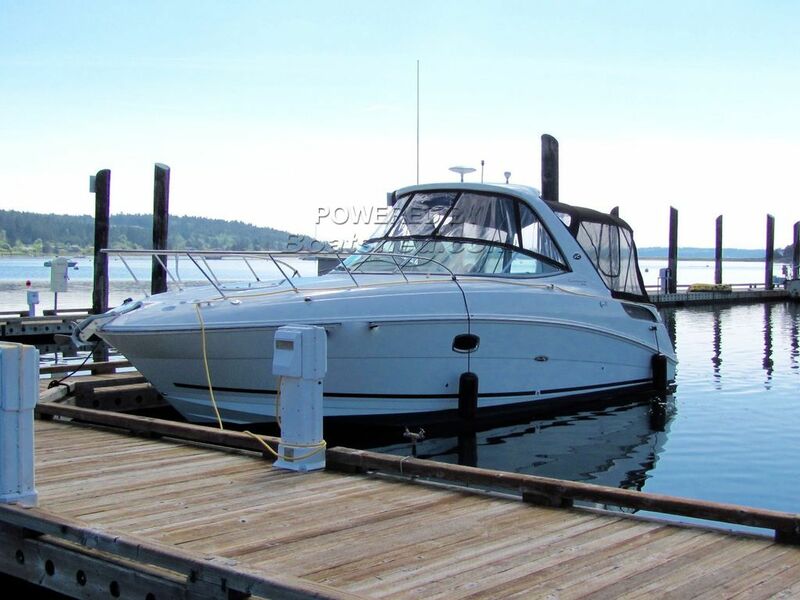 The current owner is the original owner of this 2010 Sea Ray 310. Each winter it is moved to heated dry stack storage. Winter 2019 maintenance includes new zincs and fresh bottom paint. Stepping aboard, the molded swim step includes platform storage lockers, which seem best for wet storage or perhaps as coolers. There is an additional storage locker on the backside of the aft seating where shore power is connected and fresh water wash down. A fresh water shower is located on the starboard transom for a quick rinse after a swim. The cockpit area is covered with snap-in carpets that are easily removed for cleaning. Access to the engine compartment is via an electric actuated hatch lifting the aft seating area. This model sacrifices sidedecks to enhance the functionality of the full-width cockpit with generous seating, a removable table and lounging seat to port. A built in wet bar with sink, Norcold fridge, and Electric Kenyon BBQ are to starboard. The helm station is just forward of the wet bar. Along with its full compliment of electronics, the helm station includes a helm seat that swings forward and aft; you may sit side-by-side while underway or slide it forward and enjoy conversation and cocktails with friends. There is secure walkthrough access to the foredeck via molded steps and opening windshield. Entering the mid-cabin area via the hatch to port, I was pleasantly surprised by the spacious accommodations. Finishes include dark cherry veneer cabinetry, hardwood flooring, and neutral brown cloth upholstery. Forward is a U-shaped seating area with dining table that converts to a queen v-berth with storage lockers on either side. A privacy curtain separates the sleeping area from the main salon, and a flatscreen TV on the port can be viewed from anywhere in the cabin. Aft to starboard is a small dinette that converts to a single berth. Across from the dinette is the galley with a Sharp microwave, Dometic fridge below the one-burner electric/butane cooktop and sink. The head has a Dometic vacu-flush toilet and has shower capabilities. The double midship sleeping area is aft and has storage cabinets at both your head and feet. Raymarine Hybrid touch screen; Navigation with radar and chartplotter - E7 Multifunction Display. VIRTUAL TOUR - VIDEO - 80 TO 100 PHOTOS - FULL SPECS CAN BE VIEWED OF THIS SEA RAY 310 SUNDANCER! This Sea Ray 310 Sundancer has been personally photographed and viewed by Gretchen Miles of Boatshed Everett. Click here for contact details. Please note this comments section is public. Please do not post your personal details here. To enquire about purchasing this boat, please contact the broker directly at gretchenmiles@boatshedeverett.com. Please read our commenting guidelines before posting.